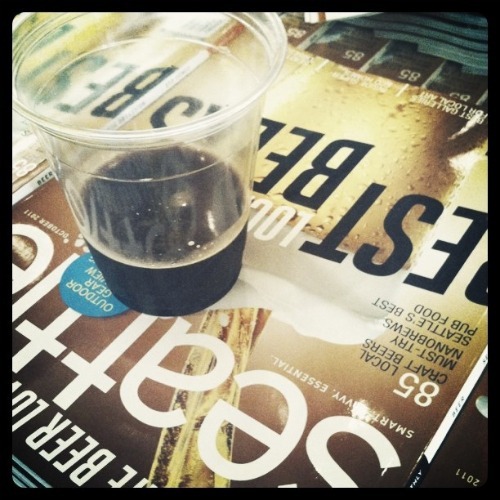 Craft Beer + Food Pairing: Miss the Event? Here's Your DIY Guide! It's not every job that requires an appreciation of beer—only the best jobs, like mine. For the past few months, while our team was whipping up the October "Best Beers" issue, there has been beer a-plenty 'round here: Beer tastings, beer research, beer history and plenty of beer-related strategy meetings, for which we were joined in our suffering by beer blogger extraordinaire Kendall Jones of the Washington Beer Blog. Kendall's encyclopedic knowlege of (and abiding love for) beer was a driving force behind our epic 24-page beer feature--the biggest beer feature I've ever seen in any lifestyle magazine, national or local, bar none. Anyway, fresh off the release of this suds spectacular, we headed down to Kendall's Craft Beer + Food event, a benefit for the Just Garden project (co-sponsored by Seattle mag) which quickly sold out. Eleven local breweries and eleven local restaurants teamed up to create eleven stations at which guests tasted a dish and sipped a complementary beer. If you've never taste a beer and dish specifically designed to go together, you're in for a treat. Try it yourself with our handy "beer and cheese pairing" guide for starters. But the fare on hand last night was way beyond a cheese plate: Trellis was dishing up some fierce ribs with Pike Brewing's Kilt Lifter Scottish Ale (one of the beers on my bucket list); across the (sunset-filled, waterfront marina) room was Brave Horse Tavern, which had created teeny brats topped with saurkraut on a pretzel bun to pair with Schooner Exact's Brave Horse IPA. You get the idea: craft beer + food heaven! Here's hoping Kendall does this event next year (and we'll let you know if he does). And grateful shouts to Seattle mag's crack events team; those guys know how to throw a party!